In this world, when one is born, there are a lot of values which are imparted. One thinks that being happy and cheerful means the world to all. However, there are many other things which are necessary and which are equally important. It is not just enough that you live this life for your own self and do not care much about others. That someone will come only with you if you have a caring and thankful attitude. There are many layers to this saying. It can mean anything and everything to you once you have completely first understood what it means. 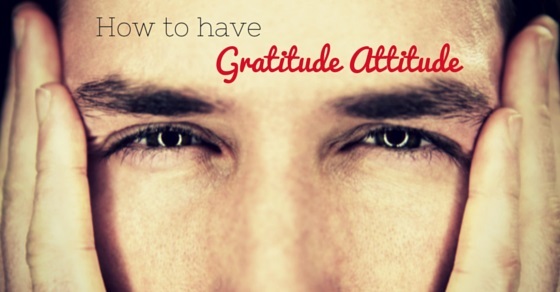 What Does Having a Gratitude Attitude Mean? Having a grateful attitude means a lot of things. It can simply mean saying thank you to the next person who gets coffee for you. Appreciation and acknowledgement are two keywords associated with being grateful and saying thanks. Yes, the g of gratefulness begins when you have emerged on the platform of saying thanks. When you begin to appreciate and say thanks to each and every one, you have become an appreciating person. Today, the value of thank you may have gone down, but the power that thanks can bring by just appreciating, can mean so much. Thus, try and infuse your thank you wherever and whenever you can. Because, it may mean nothing to you but for the person standing opposite to you, it can mean everything. When you acknowledge the contribution of a person when he or she has done something for you, you actually begin with the learning process. Yes acknowledging and thanking means that you start with the word thank you. You begin and you do say to that person that it has been very great and nice of you that you contributed and helped me in my life. You did the right thing when I needed you and you did it so great. Thus, by acknowledging the person you will not only make him happy but also you will give him the feeling that he or she has done the right thing by helping you. Thus, you may have achieved the first stage of humanity. When you are optimistic about life and when you know you have helped the person in his or her truest sense, you would have achieved something great. Being positive about any and everything truly helps. When you know that you are going to look at an opportunity or see something that is coming very truly and nicely, then you will never keep worrying about the consequences. You will ensure you have a very optimistic approach and you tend to love whatever you have done. Thus, gratefulness can even begin form this approach when you say you look at life positively. See if you have trained yourself very well to be happy, you will end up being very happy. If there remains only one thing that truly comes from presenting yourself well, then it will be able for you to create a happier life and successful one for yourself. You can only do this once you are done showing up for yourself. Thus, it becomes necessary that you very well chose your reactions. There will be times when you become more aware of what you would have said and done, then things will be simple for you. It will be easier for you to not get all worked up in to very emotional end of a situation. Though this comes with maturity you will know how to think quick and fast on your feet. This also means you will know that there would not be pain in the process. If there is this excess pain, you will also not be able to change the situation so intensely and even dramatically. In time, you will find a way to figure out how to exactly make every workable situation work even a little better. As we grow up, we tend to learn many good things and learn to shove off all bad things. However, in the long run we also learn that we have endured some bad things which we should not really have. Thus, it becomes necessary that you also learn to not take things for granted. You learn that you do not really take people just for the sake of who they are or what they do or anything else but instead learn and understand its deep meanings. You trust them, appreciate them, learn what their boundaries and do not cross them. A big part of being grateful comes in not taking things for granted because it is only when you learn this, will you be able to see the bigger picture. Why Should One Have a Gratitude Attitude? Thus, after we have learned what does being grateful means, let us now understand why we should be so grateful to others. Why is it necessary that we express that amount of thankfulness to someone who does not even care of whatever we are doing or saying? We always tend to believe that grass is greener on the other side. However for all you know grass may actually be not that greener. Thus, when you have a grateful attitude, you will know and understand the importance of what you have. When you have a grateful attitude you will easily learn that having something is better that not having anything. Just so that the concept is clear take the example of your college or work life: – You may be thinking that others have more capacity or are more talented than me. You may be thinking that they are better at what they do because they are so good. Thus, you would want to twist this concept by thinking that:-Hey, I also have my maid’s girl who is very serious about her studies. But you know what; she is not able to do anything because she is so poor that she cannot even a buy pair of uniform for herself. She wants to really do her fifth grade but because her father is a drunkard and mother earning daily wages, she is left to fend for herself and her family. Thus, wouldn’t you want to actually think that you are a better place than her? Learn to see the brighter side. Yes, God is good all the time. All the very time you think he could have gone wrong but he has not because he has planned things better for you. Whenever the doubt comes in your life when you think that you could not achieve this thing or you were very sad because such and such matter did not help you much, you tend to go with the belief that things are going wrong on your side. Actually, they may have only started to help you become even better. When things are happening or not happening for you just learn it is happening for good. Do not settle down with the fact that it was meant to be this way or something. This is the first step of learning to be grateful. For example, you are seeing this girl who you truly love. Now by chance she starts dating somebody else and you come to know how mean she could be to you, how she cheated on you or how you could have committed a mistake by marrying her. Thus, this is the fundamental of being thankful. It is the easiest example to understand and know how knowing that you having it or not having it is anytime better than any wrong thing at all. Do you know that people love the company of being with someone who is good and cheerful at the same time? Do you know people run always from people who are gloomy, sad and spread any amount of depressed kind of feelings? If you have any of these, then may be good company is not going to come near you. When you are happy, you learn to make yourself and others very happy. You trust and believe that things are going great on either of the fences and thus, people will be able to take things seriously about you. When you are thankful about people, when you say you have appreciated certain stuff, when you say that you feel very happy that this person or this thing happened to you, you not only make yourself happy but also cheer up the mood of another person. Begin with saying thanks: To people who you think have helped you in any ways. Be it as aid above the smallest things, thank them. Learn to look at things very positively: Be it even like the smallest of situations; just know that you are not doing anything wrong by waiting or learning to wait for things to happen. It is very good instead. Stop taking things at face value. Try to involve yourself deep into it. Do your homework of practicing patience and love. Be genuine and not fake: Though this concept is clear but once again a plant, a fake flower may last longer but one may not be able to smell it. A real flower though may die will live for long and one will be able to enjoy it for a pretty good period of time. Make a plan and promise yourself to shine: Make a vow that you would pay attention to go yourself completely. Truly Recognize what are your trigger points, ahead of time, and also figure out what you could have done do to avoid some potential conflict that could come your way. Try and remove yourself from any negative conversation and most definitely just refrain yourself from stirring the pot. Remember you do not have to take initiative always and thus, one can live happily if somebody else speaks up. Also Promise yourself that you will go into the situations that will show you up in the truly best version of yourself. Look for some great solutions: Take the precious time of your life to look for some good and helpful positive remedies, when the issues arise. Find good and suitable ways to combat the great conflict without possessing any negative tone. It is great to be mature about the possible outcome. One can also create solutions that you may have and never thought of before. Thus, these steps will keep you ahead of the path of being grateful. Believe in yourself: Know that it is you and only you who can take yourself up. There is no one except for you who can be better than you. You are truly good and original. Thus when you are grateful of being you, there exists no other question. You will be satisfied with yourself and content with what you are. Being grateful is not that easy, There will be problems, complications but one will have to conquer all of them to know that if you feel grateful for yourself and others, you have so made it in life.